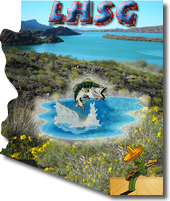 The 2013 Arizona Fishing Regulations are now available at all seven Arizona Game and Fish Department offices and at fishing license dealers throughout the state. They are also posted online at www.azgfd.gov/h_f/fishing_rules.shtml. 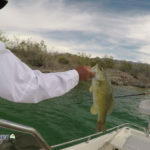 Bass, crappie and catfish are abundant in Arizona’s large lakes and reservoirs. Mountain lakes and streams will be well stocked this year with trout. Local urban lakes are regularly stocked and are a terrific option for anglers who want to stay close to home. A summary of key changes is on Page 2 of the 2013 Fishing Regulations booklet. 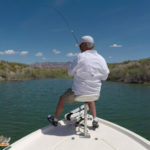 Of special interest to many anglers are limit changes at Alamo, Cataract and Kaibab lakes. 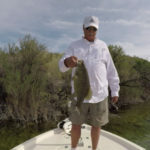 Alamo Lake – Slot limit for bass is removed, statewide limits now apply – Six bass per day with no size restrictions. Cataract Lake – Bag limits reduced to four catfish, four trout and two bass (minimum size 13 inches). 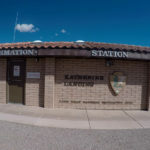 Kaibab Lake – Bag limits reduced to four catfish, four trout and two bass (minimum size 13 inches). Council Park Pond (Somerton) – Bag limits reduced to two catfish, two trout, one bass (minimum size 13 inches), and five sunfish. Frye Mesa Reservoir – Limits established to allow one Gila Trout daily (statewide limit of six trout still applies to other trout species: rainbow, brook, brown, cutthroat). Lake Powell – Change walleye limits to unlimited to conform to Utah regulations. Parker Canyon Lake – Bag limits reduced to four channel catfish (other catfish such as flathead and bullhead remain unlimited). Pena Blanca Lake – Extend current catch-and-release bass regulations through Dec. 31, 2014. Live baitfish – Gizzard shad are now legal baitfish, but only from specific areas (see page 13 of the regulations for more information). 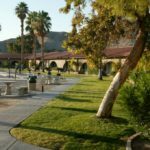 Archer Lake at Christopher Columbus Park in Tucson – Closed to fishing.